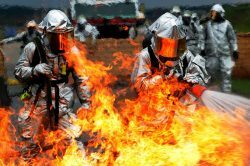 Tampa, Florida (September 2016) – Aero Simulation Inc. (ASI) is pleased to announce its latest contract award, the Recruit Fire Fighting Trainer Programmable Logic Controller (PLC) Update Program. Awarded by the Naval Air Warfare Center Training Systems Division, the program directly supports the U.S. Navy’s Recruit Training Command in Great Lakes, Illinois. 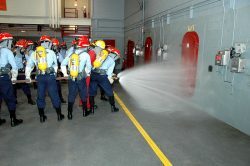 U.S. Navy recruits use the trainer during basic training to learn to escape smoke-filled compartments, open and close watertight doors, use self-contained breathing apparatus (SCBAs), carry fire hoses, and learn to extinguish fires. The program requires the replacement of obsolete PLCs with current technology PLCs.